BUT IT ISN'T JUST THE 'YOUNG GENERATION' OF THE SIXTIES to whom this magnificent tribute will appeal  music that shook up The Cavern through the decades pounds from every disc, transporting you back through the years and forward again as you listen to the talent of artistes from The Beatles and The Rolling Stones through to The Who, The Kinks, Queen, Elton John, Stevie Wonder, Rod Stewart, and Chuck Berry. 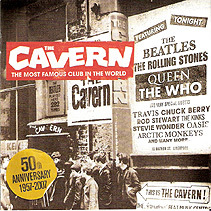 Paul McCartney performed the classic track All Shook Up live at The Cavern. The Beatles and the Rolling Stones are together for the first time ever on a commercial album, with Arctic Monkeys bringing the track list bang up to date with a previously unreleased live version of The View From The Afternoon. it first opened on 16 January 1957. The album release date was 20 August (2007), ahead of the inter-nationally acclaimed Mathew Street Festival that runs over the Bank Holiday weekend every year and is typically visited by over three hundred thousand people. Alive | Gene Vincent  Be Bop A Lula | Lonnie Donegan  Cumberland Gap | The Fourmost  Hello Little Girl | The Searchers  Sweets For My Sweet | Manfred Mann  Do Wah Diddy Diddy | Chris Farlowe  Out Of Time | Wilson Pickett  In The Midnight Hour | Ben E King  Stand By Me | Stevie Wonder  I Was Made To Love Her. Disc Two: Queen  Killer Queen | Paul McCartney  All Shook Up (Live at the Cavern) | The Kinks  You Really Got Me | The Big Three  Some Other Guy | The Animals  The House Of The Rising Sun | Hermans Hermits  I'm Into Something Good | The Moody Blues  Go Now | Gerry & The Pacemakers  Ferry Cross The Mersey | The Zombies  She's Not There | The Swinging Blue Jeans  Hippy Hippy Shake | Little Eva  The Locomotive | Cliff Bennett & The Rebel Rousers  Got To Get You Into My Life | Billy J Kramer & The Dakotas  Little Children | The Merseybeats  I think Of You | The Flowerpot Men  Let's Go To San Francisco | Elton John  Border Song. Free | Georgie Fame  Yeh Yeh | Bo Diddley  Bo Diddley | Status Quo  Down Down | Tom Robinson  2-4-6-8 Motorway | Edwin Starr  War | Thin Lizzy  Whiskey In The Jar | Rod Stewart  Handbags And Gladrags | Embrace  Are You Good People | KT Tunstall  Black Horse & The Cherry Tree | Travis  Why Does It Always Rain On Me | The Coral  In The Morning | Arctic Monkeys  The View From The Afternoon (Live  previously unreleased version). "Fifty years ago, a few jazz-loving Liverpudlians had the most exotic notion you could imagine. They dreamt of bringing the Parisian Left Bank to their hometown. Into this unfashionable Northern sea port they would import the chic ambience of a smokey 'caveau, the sort of dive where femmes fatale and French philosophers might meet to escape the straight world upstairs. So they found a pokey basement under an old fruit warehouse and they called it The Cavern. "Well, the Jazz plan faltered when Britain succumbed to American Rock 'n' Roll | nowhere fell as violently in love with the new sound as Liverpool. Incredibly, in less than a decade The Cavern became a shrine of global youth culture and a magnet for musicians everywhere. The Cavern became, in fact, what it remains today: the best known rock club in the world. "It goes without saying that The Beatles were the biggest noise in all this. They played at The Cavern nearly 300 times. So the Fabs take pride of place in this collection with a number Please Please Me, first perfected there, amid the sweaty confines of this legendary dungeon at 10 Mathew Street. Here as well are their peers on the Merseybeat scene that quickly colonised British pop, like Cilla Black and Gerry & The Pacemakers. Here, too, are the great acts who followed The Beatles to America and reshaped the very meaning of rock music  bands like The Rolling Stones, The Animals and The Who. They all played The Cavern, as did many American legends, Chuck Berry and Bo Diddley among them, whose own music had inspired those British groups in the first place. "Somehow The Cavern story never stopped being eventful. In spite of its fame it went bust in 1966. The closure caused such an outcry that the Prime Minister Harold Wilson had to rush up to Liverpool to reopen it. By the early 1970s, even though it attracted hot new bands like Queen, it was back on the skids. They closed it down, the warehouse was demolished and Brian Epstein's beloved "Cellarful of Noise" was filled with rubble instead. Yet a New Cavern opened across the street, was renamed Eric's and spawned as many world-famous acts as the original Cavern (Elvis Costello, Echo & The Bunnymen and Frankie Goes to Hollywood were but a few). "But Liverpool without The Cavern Club? It just didn't seem right. So they rebuilt it, brick-by-brick, back in 10 Mathew Street. It re-opened in 1984 and, marvellously, it's there to this day. Oasis, Arctic Monkeys, The Coral, Travis, Embrace and KT Tunstall and, in 1999, a certain Paul McCartney are the calibre of acts who have taken The cavern into a new era. It's more than a club, this place. On one level, the Cavern's story is a microcosm of the city in which it stands  a classic Liverpool tale of drama, disaster, romance and rebirth. And on another, it has a credible claim to be the cradle of British pop. The Beatles believed their Cavern years were their best as live performers. "In the fractured final days they tried, poignantly, to rediscover their lost solidarity as a tough young Liverpool combo. The spirit that informed Get Back was really the spirit of the Cavern. There is a long-held school of thought which holds that Mathew Street is a place of mystic energy  Bill Drummond of the KLF believed a ley-line ran along it. Opposite today's club, a life-sized bronze John Lennon lounges against the wall. Beneath his hooded gaze, the music fans still troop downstairs for an experience they will never forget. Let these songs stand in tribute to a little hole in the ground that really changed our world."